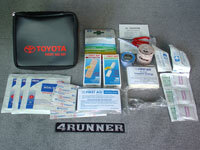 This handy First Aid Kit puts supplies where they are needed, when they are needed. Store in a convenient location for easy access. FDA compliant, the kit includes sterile medical dressings, various types of band-aids, anti-bacterial ointment, and an assortment of other supplies. The case is made of soft vinyl with a zippered closure. 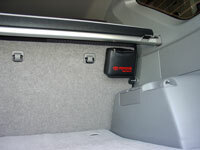 It has velcro strips on the back and attaches to the carpeting on the rear of the seats. It also fits in the glove compartment. Sterile pads 4" x 4"